The Ziama Massif is part of the Guinean Highlands region; elevations rise nearly 1,400 m above sea level. This mountain range is characterized by rugged terrain with valleys, plateaus, rocky peaks, cliffs, and granite outcrops. Mean annual precipitation varies from 1,700 mm to 2,000 mm. The vegetation communities on the massif include savanna, primary dense mountain forest, secondary mountain forest, as well as woodland in the northern valleys, plains and swamps. The massif supports a great diversity of Guinean zone tree species. This highly biodiverse area, with a great number of threatened mammal species (chimpanzee, Diana monkey, pygmy hippopotamus, elephant) and a large diversity of plant species, is one of only four biosphere reserves in Guinea. 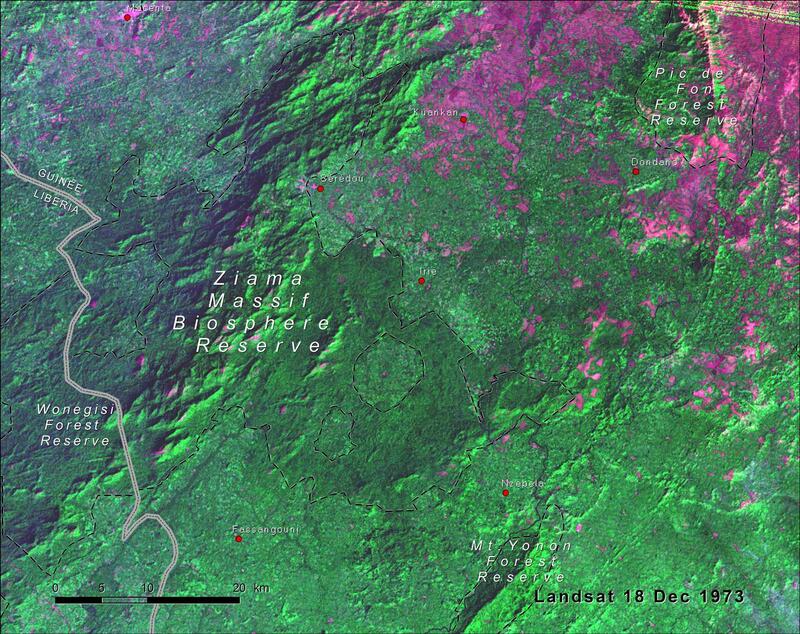 The Ziama Massif was designated a forest reserve under French colonial rule in 1932, in an effort to stop “savannization,” the perceived advance of the savanna from the north. After independence, however, the new state-run economy put major emphasis on agricultural development, with biodiversity conservation given very low priority. As a result, farmers cultivated many of the protected areas established in the colonial period. In 1981, the Ziama Massif was made a Biosphere Reserve. In order to better engage local support, conservation is enforced with decreasing intensity outward from the core and allows increasing rural development activity in the buffer and transition areas (Fairhead and Leach, 1994). As in the case of the Kangari Hills in Sierra Leone, the conservationists’ view of a supposedly“pristine”forest stands in contradiction to evidence of abandoned village sites and detailed written and oral accounts of a prosperous agricultural landscape in the mid-19th century, accounts that have shaped local perceptions. Clashes between subsistence needs of a growing population — 29,000 people in 23 villages in and at the margins of the reserve, and in the town of Sérédou — and long-term conservation interests have been exacerbated by the slow start of promised rural development activities in the buffer zone (Fairhead and Leach, 1994). It is unknown to what extent the management plan for timber extraction and agroforestry in the buffer zone is being followed, or to what extent shifting agriculturalists and refugees are exploiting and encroaching the reserve (Brugiere and Kormos, 2009). 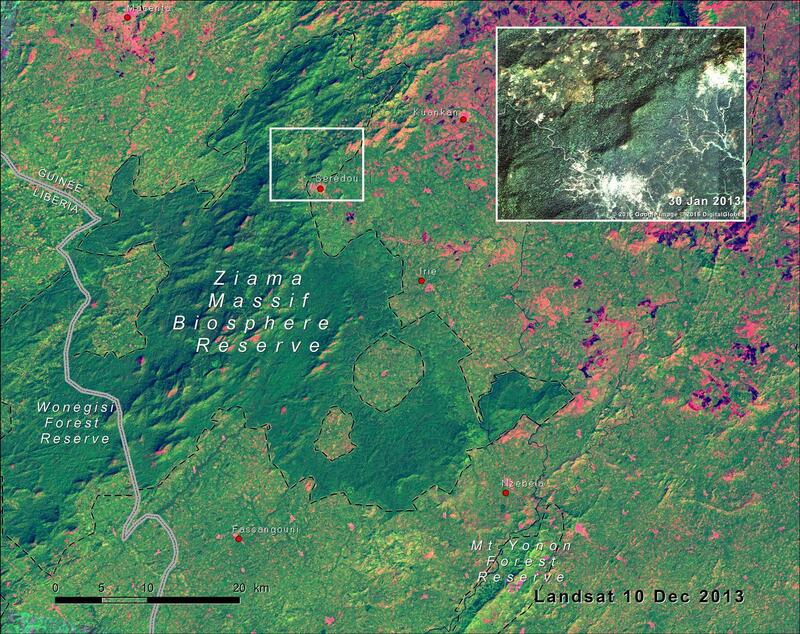 The Landsat images of the Ziama Massif and surrounding area from 1973 and 2013 show relatively stable forest cover inside the Biosphere Reserve. In 1973, agriculture was already present around the reserve, but the surrounding landscape was still wooded and dominated by natural habitats. By 2013, farmland replaced most of the savanna and woodland outside of the reserve boundary. Agriculture started to encroach on the outskirts of the Ziama Massif, especially in the northern part around Sérédou (see inset). With rates of population growth of 2.6 percent per year, an influx of refugees from neighboring countries, and the predominance of itinerant agriculture, there is a need for careful planning and multi-stakeholder management in order to preserve this hotspot of biodiversity.